The [Rhode Island Turnpike and Bridge Authority] has determined it is feasible to add a path for pedestrians and bicyclists to the Newport, Jamestown-Verrazzano and Mount Hope bridges; the Sakonnet River Bridge already has such a path. 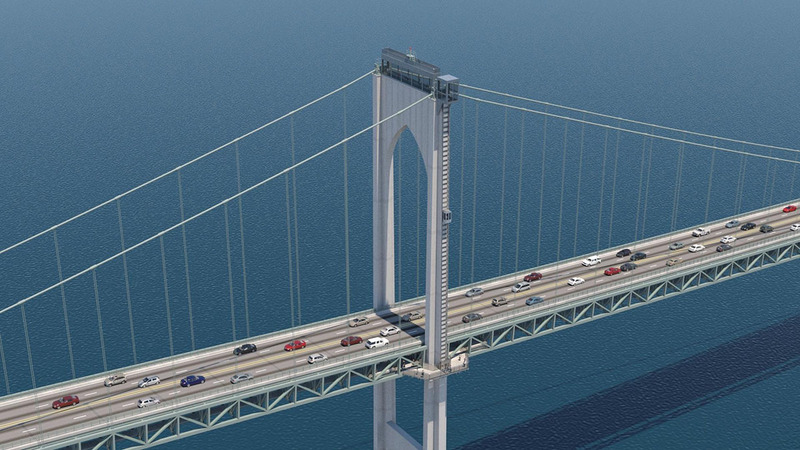 It is also possible to construct an enclosed observation deck atop one of the two towers on the Pell Bridge. He stressed that the authority hasn’t completed any designs for the paths or observation deck, nor has it secured any funding for the initiatives. A preliminary cost estimate for the paths along the three bridges is between $25 million and $50 million; the authority did not have a cost estimate for the observation deck. But the authority has determined that the bridges can handle the increased load, according to Eric Offenberg, its director of engineering. PLEASE TAKE ALL MY MONEY AND BUILD THIS NOW! This would be a legit tourist destination, and if they charged a buck or two to take the elevator up to the observation deck, it could help pay for maintenance. I don’t think this connects to any major bike paths though, right? A path on the bridge could be an extremely valuable part of an integrated state wide pathway system.